While books about the War in the Atlantic cover the campaign to sink the Bismark, or the U-boat campaign, little or no attention is paid to the bitterly-fought campaign involving the Arctic Convoys. For three years this vital lifeline helped keep Russia in the fight, and gave her the tools she needed to stand her ground against the German onslaught on the Eastern Front. In late 1943 these convoys were the life-blood of the Allied war effort in Europe. That summer a powerful German surface force gathered in the Altenfjord, near the northernmost tip of Norway. From this secure base it could strike against these convoys, and the British had precious few resources to spare as convoy escorts. However, in September the battleship Tirpitz was attacked and put out of action by British midget submarines, and the pocket battleship Lutzow was sent home to Germany for a refit. That left the battlecruiser Scharnhorst. The man commanding this German surface force was Admiral Bey, who was under severe pressure from Hitler and his superiors to show results, and to relieve the pressure on the Eastern Front. This made a face-saving sortie by the Scharnhorst inevitable. Then, in late December German aircraft spotted a new Arctic Convoy - Codenamed JW55B - which was bound for Murmansk. Admiral Bey was ordered to attack. However, the British were well aware of his plans - the convoy was little more than bait, as lurking behind it, and hidden by a storm front lay two naval forces - one of which was led by Admiral Fraser, commander of the British Home Fleet, who flew his flag in the battleship powerful HMS Duke of York. Little did he know it but the Scharnhorst was sailing into a trap. 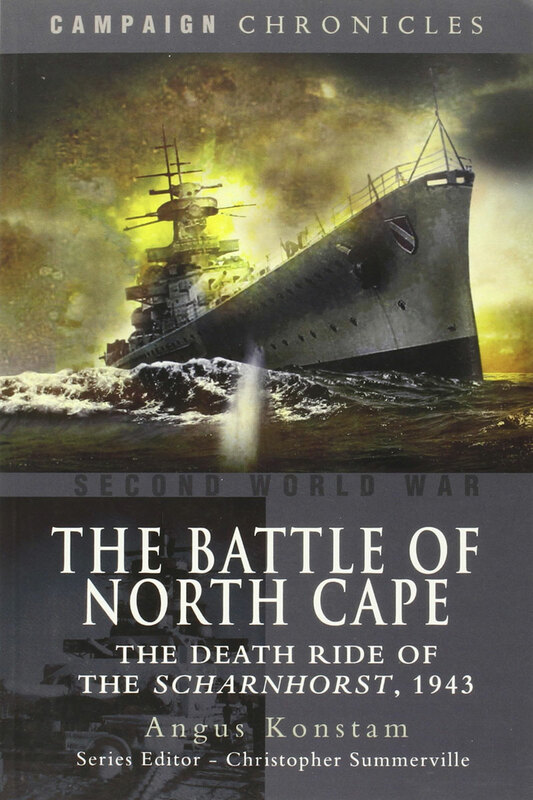 What followed was as the Battle of North Cape - a series of moves and countermoves made by the two naval adversaries in the days surrounding Christmas 1943. this was a battle fought in almost complete darkness and in the teeth of a raging gale. Ultimately radar and superior numbers played their part. Surrounded by her enemies, and pummelled by shells and torpedoes, the battlecruiser Scharnhorst finally slipped beneath the cold raging waters of the Barents Sea, taking almost 2,000 man of her crew down with her. This book tells the story of this largely forgotten but pivotal naval battle - it was the last surface duel between battleships in the history of naval warfare. Renowned naval historian Angus Konstam shows how the hopes of the German Navy went down with this last great ship. He also examines the performance of Admiral Fraser and Admiral Bey, and argues that Admiral Fraser should be acclaimed among the ranks of Britain's great fighting admirals.